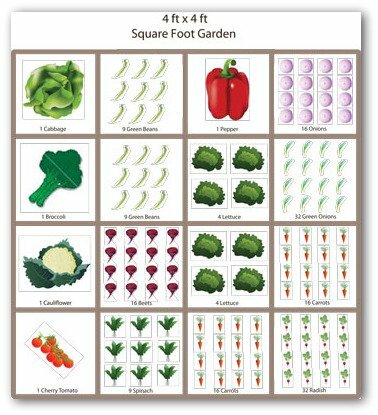 Use our free garden layout designs, garden planning software, vegetable garden worksheets and more to help plan your vegetable garden! 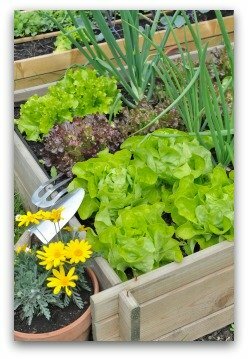 We offer plans and tips for a raised bed, container, or traditional backyard garden to help you get started. Click here to go to the page with all of our free sample garden plans! It is actually rather easy to plan a garden to be decorative and productive at the same time. The vegetable gardener's major focus should be in selecting a location that receives sufficient sunlight for the crops. A secondary concern is providing enough space for each crop. It is true that plant diseases and pests are less troublesome if the plants are planted haphazardly, but the yields suffer in the end without uniform planning. 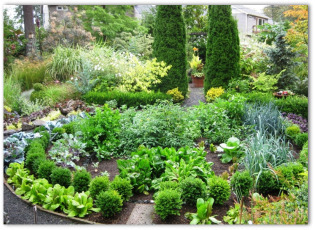 Our goal is to share free garden layout designs to get you on the right path for bountiful harvesting. Use our free garden layout designs software to create your own unique garden plan. 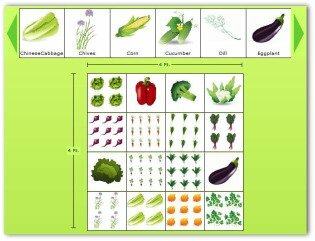 It's easy: simply drag and drop the vegetables you choose into the garden grid. 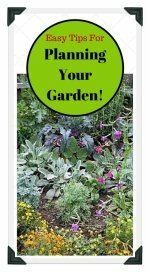 You can print your garden plan, and use it when purchasing seeds or plants for your garden. Creating a knot garden, container garden or raised bed are ideal designs to use when growing vegetables. Whichever of our free garden layout designs you choose, if you want high-yielding, tasty, and succulent crops, the plants have to be provided with the proper conditions. Vegetables require rich soil, little competition over space, minimum shade, and ample moisture. 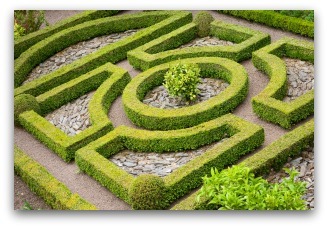 Knot garden design example. Vegetables can be planted in the enclosed spaces. Vegetable crops can be used attractively. You can devote small beds to them as part of a formal or informal design. These beds do not have to be rectangular shaped. 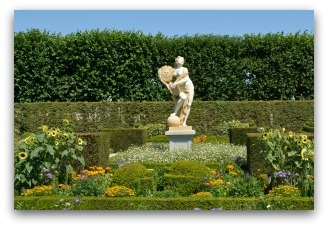 One of the most pleasing forms is the ornamental or knot garden, which relies for its appeal on structure and design with a geometric pattern of small beds and pathways. A plan for a geometric garden of about 38 feet by 46 feet could consist of gravel paths flanked with low hedges. 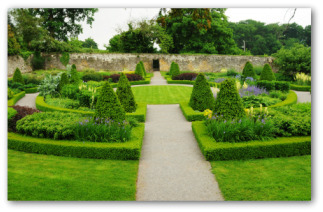 An example of planting for a knot garden includes: the top bed planted with herbs, the bottom beds with perennials such as rhubarb, side beds with strawberries, artichokes, and annual plants. This leaves eight 'core' beds for the main crops of vegetables. A bird bath or water fountain could decorate the central area. 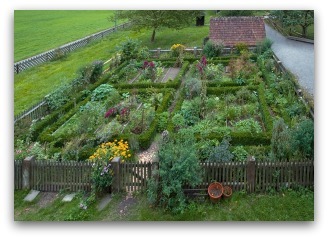 A mixture of vegetables that are used in making salads can be grown in a knot garden. Salad-bowl lettuces in various colors are both practical and attractive to plant. Another bonus to planting lettuce is the crops are relatively long-lived, so harvesting leafs as needed will not leave gaps in the garden. To have more food available and plus maintain appearances, plant replacements can be continually produced in a seed bed or cold frame. Zucchini and cucumbers can be both ornamental and functional planted in borders of the knot gardens. Tomatoes are always in high demand and should be given sunny positions and rich soil to produce a quality crop. Scarlet runner beans add color and good taste. Asparagus adds a delicate, feathery touch as well as a delicious tasting vegetable. An ideal plan for many gardeners you will find in our free garden layout designs is for raised beds. To begin, we list the disadvantages of a traditionally planted row garden to shed light on the advantages of a raised bed. Vegetable gardening in rows leads to non-permanent paths that quickly become compacted, which means the entire area has to be re-dug every single year. More space is wasted as well with row planting. Plants are unavoidably brushed against while you are working in the garden. This greatly increases the risk of plant diseases attacking the damaged surfaces. Additionally, the scent released may attract and guide pests. Dividing the vegetable garden up in raised bed fashion has one great advantage which is the creation of more manageable units. Rather than weeding the whole site, it is easier to concentrate on the most critical beds, leaving less crucial ones until later. Planning and allocating with free garden layout designs makes deciding which vegetable should go where much simpler. 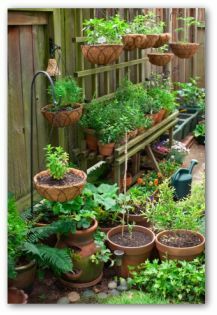 Sometimes a container vegetable garden is the perfect solution for your gardening needs. Container gardens can be any size, shape, and any number of containers. The only real requirement for container gardening is finding a sunny location. Most vegetable plants require at least 6 hours of sunshine per day to prosper. Be sure to use high-quality potting soil to fill your containers. The container sizes can range from herbs in quart-size containers, to 5 or 10 gallon size containers. If you only have access to a shady or semi-shady location, try planting any lettuce varieties, spinach, Swiss chard, radishes, beets, peas, cauliflower, Brussels sprouts, broccoli, and beans. 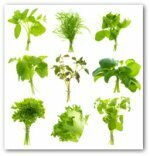 These leafy vegetables require at least 3-6 hours of sunshine per day.